Ever since we were in St. Mary’s working on the boat, Margaret and I have been discussing what still absolutely needs to get done and all the jobs that we would like to finish before we splash her in May. We have managed to dismiss a number of tasks from both lists, realizing that some can wait until a later date or are just not that critical. But, try as we might, we cannot completely eliminate all the jobs from either list. 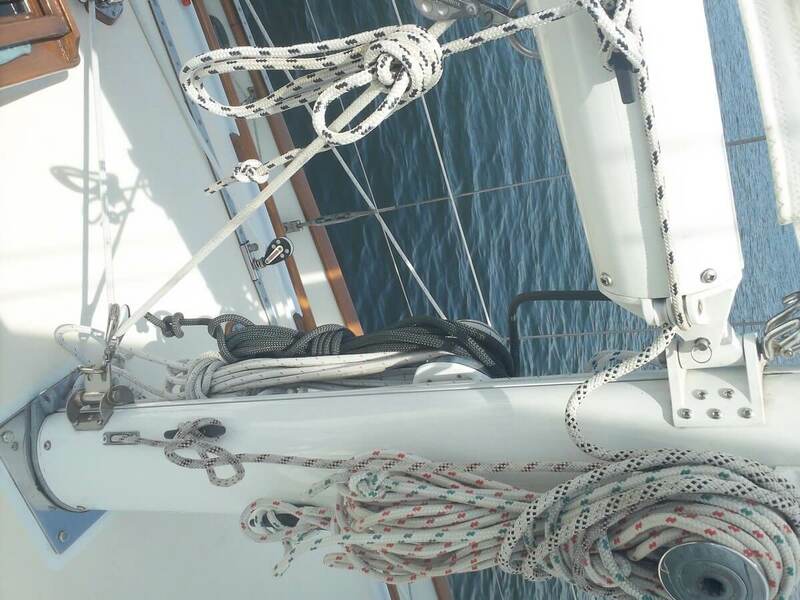 While a good deal of this work we can do from Peoria, such as making the cockpit and v-berth cushions, other jobs like tending to the mast and rigging can only be accomplished at the boat. Consequently, Margaret and I have settled on a plan of attack for those things that we need to be on site to finish. In mid-February, I will drive my rickety old Honda CRV that has some 270,000 miles on it from Peoria to Miami, picking up my Dad along the way. My Dad and I will attend the Miami Boat Show where I will be looking to gather information from quite a few vendors on all sorts of products, some of which we will be purchasing and installing before the summer, but many more that we intend to add to Bear in the coming year or two. Margaret and I have already begun to sketch out a plan of attack for the show, but I will discuss our plans for the boat show in more detail in a future post. After spending two or three days at the show, my Dad and I will then make the long trip up the coast of Florida to St. Mary’s. My Dad plans to stick around for about three days while we ready the mast and then unstep it with the help of Rocky and his crew at St. Mary’s Boat Services. However, I still need to contact the yard and make sure they can pull the mast that week, so some of this scheduling may be in flux. After the mast is off the boat, my Dad will rent a car and drive back to my folks’ place in North Port, Florida where he will return to his life of golf and cocktails (just kidding…a little bit). 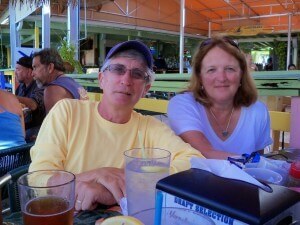 My folks with cocktails…golf probably just finished. Over the next three weeks following my Dad’s departure – with a weekend flight back to Illinois in the middle of it to see Margaret – I hope to remove and inspect all the fittings on the mast, paint the mast, reinstall all the fittings, replace our intermediate stays, and replace our chainplates. Just writing all that out makes me very nervous, both because these are some serious projects and because I fear that I am going to have difficulty getting them all accomplished in the short time frame. Of course, I am going to do everything possible to finish the job and do it well, including educating myself as much as possible before getting down there, making sure I have all the tools and supplies I anticipate needing, setting up a sensible schedule so that I can get parts fabricated in time to use them in the work, and, possibly, hiring some expert assistance. 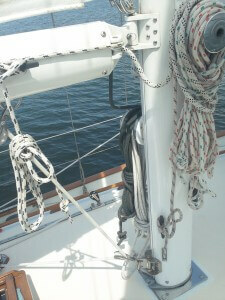 Just thinking about all the rigging that we need to take off before we can unstep the mast worries me. At least we have a deck-stepped mast, which should save a hassle or two. In addition to all that work, there are still other items on our list of things that need to be accomplished before we put the boat in the water, including finishing the work on our freshwater and raw water systems, redoing the rebedding of the stanchion bases from January, fixing a small ding on the leading edge of our keel, and over a dozen other tasks that range in difficulty and will require varying amounts of time and effort. Hopefully I will check off a few of these items while I am down there next month. But I will also have the option of doing some more work in the last three weeks before we splash, with Margaret joining me at the end of that time. We can also delay our commissioning if necessary. However, in looking at the temperature averages for May in St. Mary’s and thinking about the no-see-ums that seem to thrive on the St. Mary’s – not to mention that it would cut into our summer aboard – we would like to avoid that option. We will see how it all goes. And we will certainly have some more posts in the coming weeks about exactly what we still need and want to accomplish and how we are going about getting those things done.